Official Group Items for you. 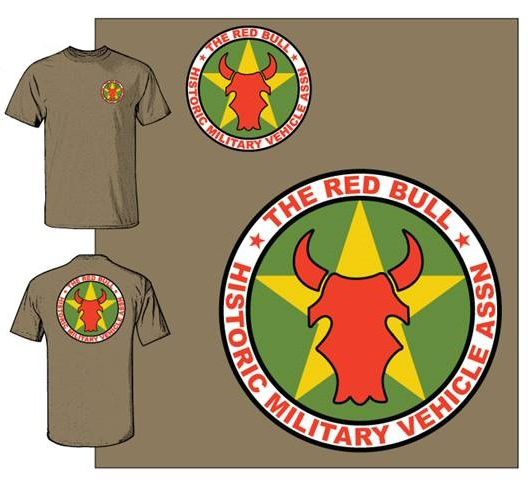 Order your new Red Bull Historic Military Vehicle Association T-shirts Now. Orders are being accepted now! This great, must-own T-shirt is made from a heavy weight cotton ideal for your summer activities, just running around town or relaxing around the home. The color is Prairie Dust in Sizes: L – XXL. Large to XL are $15.00 each, ‎2X or 3X are $17.00 each. 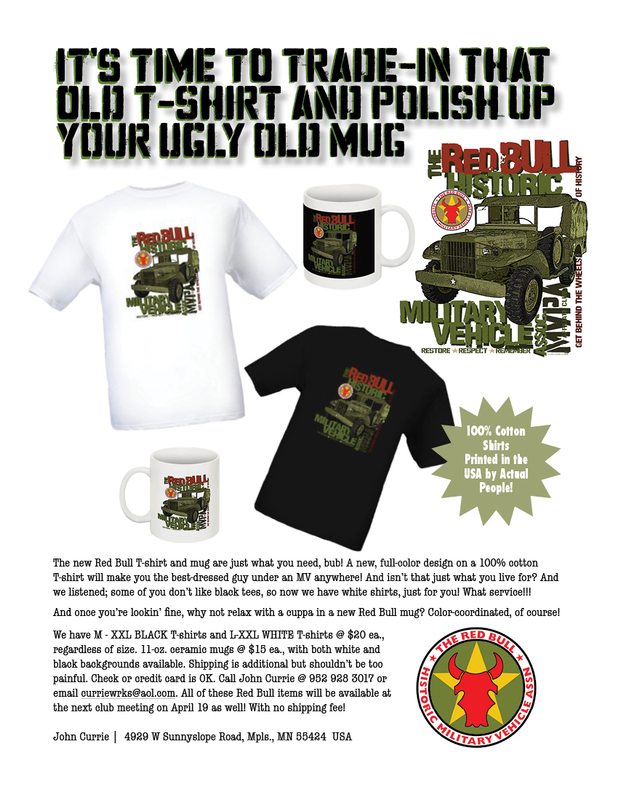 Order several for yourself, or mix or match sizes (perhaps a matching shirt for the Missus!). Shipping for one shirts is $4.50 total, but if you order 3 we will hold the shipping cost to $4.50. Avoid any shipping fees by having your pre-paid orders shipped free for pick up at the next meeting. So if you order by April 20, you’ll have your shirts at our very next meeting on April 25! Better still, if you pre-order by April 20, you’ll save $1.00 per shirt, bringing your price down to $14 to $16 each, regardless if you have them shipped directly to you or for pick-up at our next meeting. Add shipping cost of $4.50 for 1 - 3 shirts. You’ll be able to select the number of shirts on the next page. And if you want to order more than one size, use the “Continue Shopping” button on the next page to add more shirts to your order. Use the "Continue Shopping button" on the next screen to add to your order. PS: Pre-order sale ends April 30, last date for $1.00 per shirt discount. Order Now.